"Coverall Roofing was highly recommended to us by friends..."
This is a rather new home, however the old, low quality shingles just weren't holding up anymore. In came Coverall to the rescue -- with some beatiful Owens Corning Duration Shingles. Roof replacement installed in Macomb, Michigan. Roof is sagging over rear bay window. Appears that boards underneath the roof are damaged. Roof damage during recent wind storm. I am looking for a quote for a complete shingle tearoff and replacement. I have a possible leak coming into my 2nd floor bedroom. I had a window guy out and he ruled out that it's the window. I have contacted my insurance company and they would like me to get a few quotes. I need a new roof and I'[m shopping around. I need an estimate. Few shingles missing from last windstorm, maybe there is other damage. Need an inspection and repair estimate. As the local roofing experts in Macomb, Coverall Roofing are the professionals you need to solve all your roofing problems. We provide quality roof repair and roof replacement services for residential roofs, and we can help you get the right services to maintain your home. Coverall Roofing has been providing quality roofing services since 2000, and we know what it takes to give you a complete roofing solution. Our products come from industry leading manufacturers, and our experienced roofers always put customer service first. We pride ourselves on making sure every customer is completely satisfied with the work that's done on their home. If your home has any of these issues, Coverall Roofing can help. Our complete roof repair services will help you maintain the integrity of your roof and keep your home safe and dry. Many homeowners see a roof replacement as a major hassle they want to avoid if possible. However, a roof replacement can have several benefits for your home. A new roof will provide much better weather protection, giving you peace of mind that your home will be protected for years to come. Modern roofing materials have excellent lifespans when properly maintained, ensuring that a new roof is a worthwhile investment. A new roof also improves any home's curb appeal and property value. Many homeowners choose to replace their roof for the aesthetic value, and a roof replacement is a great upgrade for homeowners considering selling their house. If you think roof repair, roof replacement, or siding replacement is right for your home in Macomb, call the experts at Coverall Roofing today. We provide free estimates on all our roofing services! 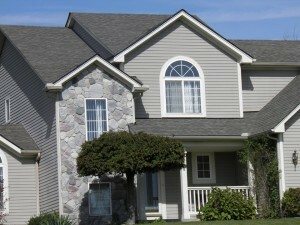 Doing repairs in Northville and Canton and putting a new roof on in Macomb. Has the storms recently caused some damage to your home? Don't wait for the storm to clear call Coverall Construction today to have your problem resolved. 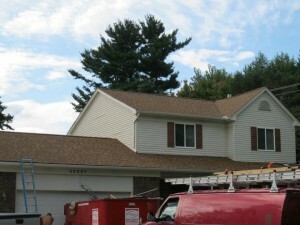 New roof installation in Macomb, MI.